Why is my scan of a site plan of the ancient Roman City of Leptis Magna in Libya getting a consistently high number of views? Of the over 4,000 images I’ve uploaded to my Flickr account so far, this one pops up fairly regularly with the highest number of daily views. I’m curious as, well, it’s not that awesome an image, so why is it so popular? 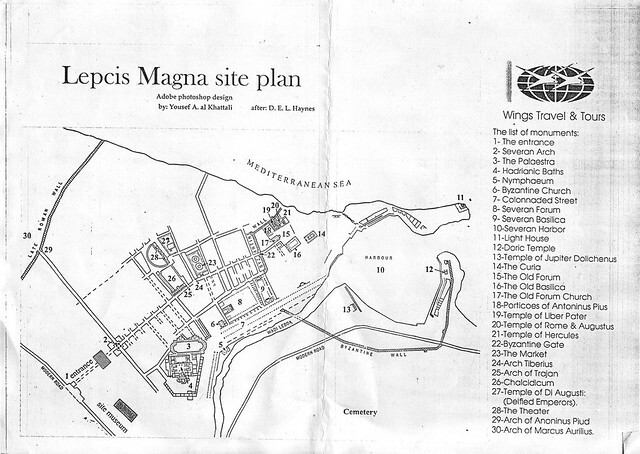 I did a Google image search for Leptis Magna map, and although my scan is the 11th image, it is the first map of the city that shows any real detail that would actually be useful. That explains it. Leptis Magna was a prominent city of the Roman Empire, but dates back to around 1100 BCE and was founded by the Phoenicians. It lies on the Mediterranean in Libya, about 130 km east of Tripoli. What makes the city such a wonder of the ancient world is that it has been buried by the Sahara Desert since antiquity and is incredibly well preserved (earthquake damage notwithstanding). In fact, the major part of the city is yet to be excavated, and because it is in Libya, it’s not overrun by tourists either. “The desert represents more than 90% of the Libyan territories, and forming an important Libyan resource, where there are many tourist attraction landmarks, having special interest for the tourists. 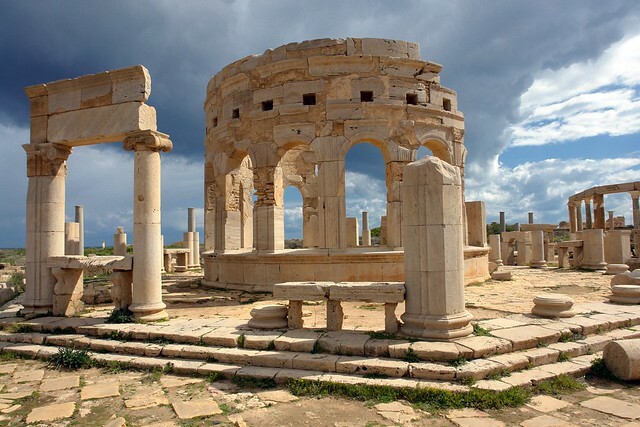 This includes the various landmarks, landscapes and big fortune of before history arts, agricultural and urban constructions in villages and habitations in oases, desert lakes, in addition to the distinct folklores and cultures in oases and desert cities. Such a diversity in desert tourist phenomena in Libya gives several opportunities to perform entertainment, cultural and scientific activities to satisfy the desire of the adventurer tourist and the amateur sportsman tourist through the desert paths, as well as the explorer tourist interesting in researching of all new, the researcher of human cultures and antique heritage, and the studier of nature and history.